Foreground: Un père très calme. At Sainte-Anne, the spring and summer immersion sessions include a workshop component. Since I love the stage and was newly eligible for it, I chose the theatre workshop. 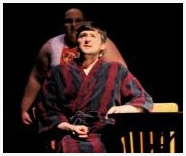 This marked my first time performing in a production staged in the medium of French. The play, which the facilitators wrote just for us, was about a sisterly feud that results in a kidnapping. I played the preternaturally calm father. I was inspired to play it a bit like Mr. Bennet from Pride and Prejudice. We were lucky enough to have a Radio-Canada reporter stop by on our rehearsal. An instructor from France remarked to me at breakfast the day the story aired: "I heard you on the radio this morning! All of Atlantic Canada heard you." I chuckled; I was certain that virtually none of my anglophone friends were listening. 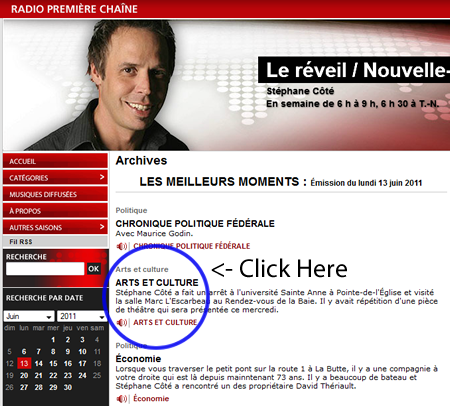 Folks in the know, though, do listen to Espace musique, but we were on Première Chaîne. Click on the Arts & Culture component to listen to our clip.